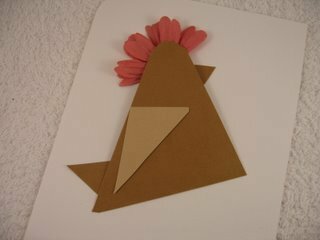 We have made cards from ovals and circles, now how about a Chicken Card made from Triangles? 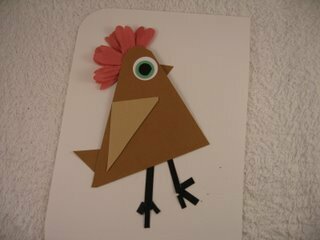 Here's a card with a difference, and made with simple triangles of various sizes. All hand cut and with no special skill needed. The only added extra is the paper flower that makes the chickens comb. 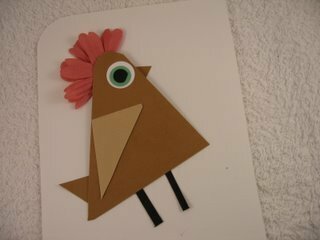 And of course the ever useful "Googly Eye"
The first thing is to cut your triangles out. You will need a large one for the body and I have rounded off the top of this. Several smaller ones and the paper flower. Fold the paper flower in half, so that the petals are all to one side. 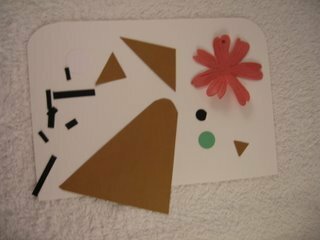 On top of this lay the large triangle, with the rounded edge just on the flower. 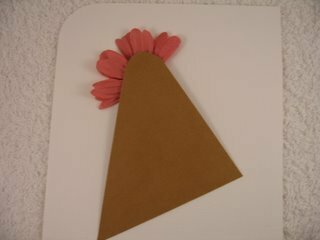 Add a small triangle to the front for the beak, and a slightly larger one to the back for the tail feathers. I used a different colored triangle for the wing and added it with foam pads to raise it up. Add the white and colored card to the head for the eye, then layer it with a colour of your choice and then black for the eyes centre. ... and on the bottom of these I have added more small strips for the feet. I added some backing paper to the card, and tied it with a ribbon around the spine, and generated a computer sentiment. 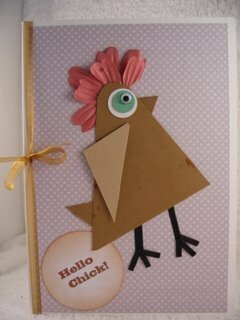 And then as I was adding the completed chicken to the front I stuck a big glue fingerprint on to the body...dirty girl...so guess who will have to do this card again???? But at least you get the idea...Yes?